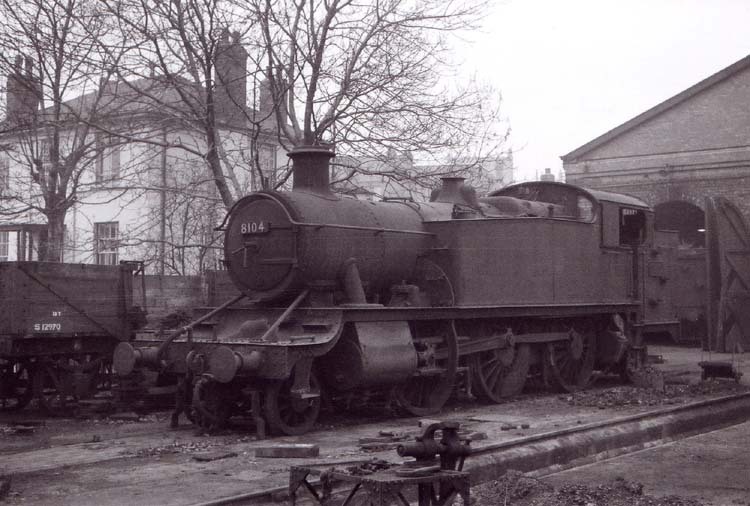 It is interesting to compare this photograph which was taken on 5th January 1965 of No.8104 out of use near to the Boiler Washout shed with that taken by Andrew Smith about four months later. Note, for instance, that the front number plate has disappeared! 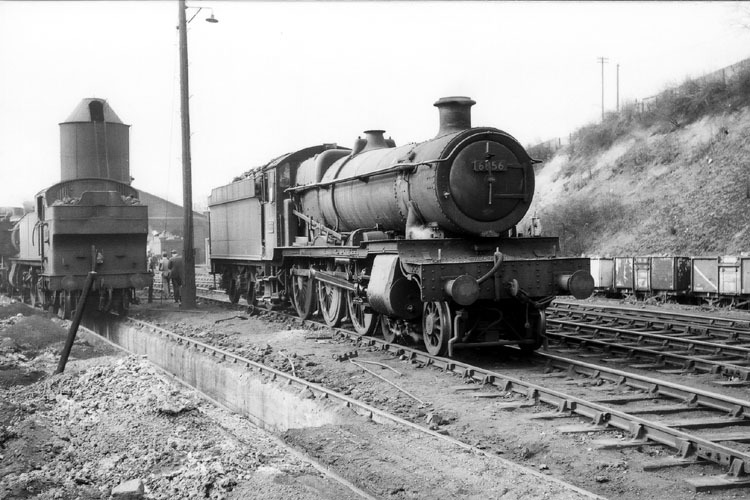 This is an interesting photograph of Collett 0-6-0 tender engine No.2222 parked on the sidings that separated the two engine sheds at Worcester. This photograph was taken from 'Railway Walk' on 26th March 1965 and shows a wealth of detail that will be of interest to the railway modeller. The tender engine is No.4992 'Crosby Hall' which by this time was devoid of its nameplates but still retained a cabside plate. The words 'Neath Loco' chalked on the tender do not indicate the loco's home shed (which was Severn Tunnel Junction) but are perhaps an aide-memoire that the loco was due to work that evening's freight train to Pontypool Road (a train commonly known as 'The Neath'). 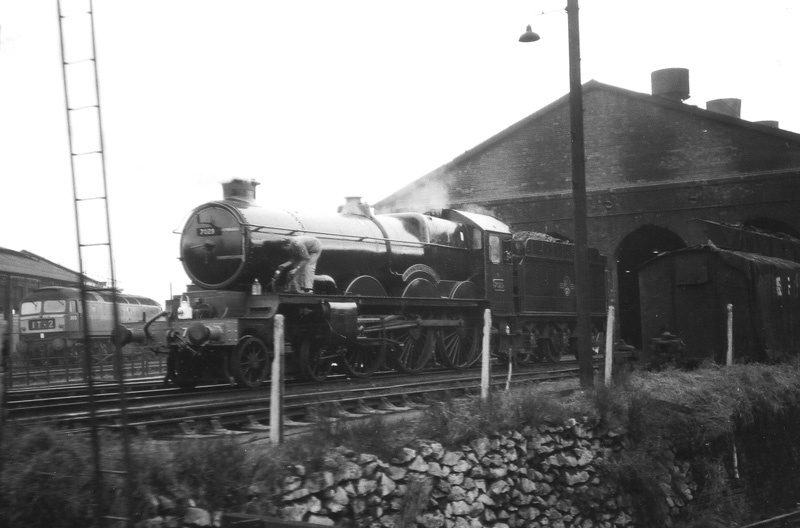 'Crosby Hall' was delivered new in 1931 but lasted only a few more weeks in service being withdrawn in April 1965. Other locomotives on view include No.4664, one of Worcester's small allocation of pannier tanks and No.6155 also of Worcester shed. In the background alongside the temporary diesel shed is an English Electric Class 37 diesel. 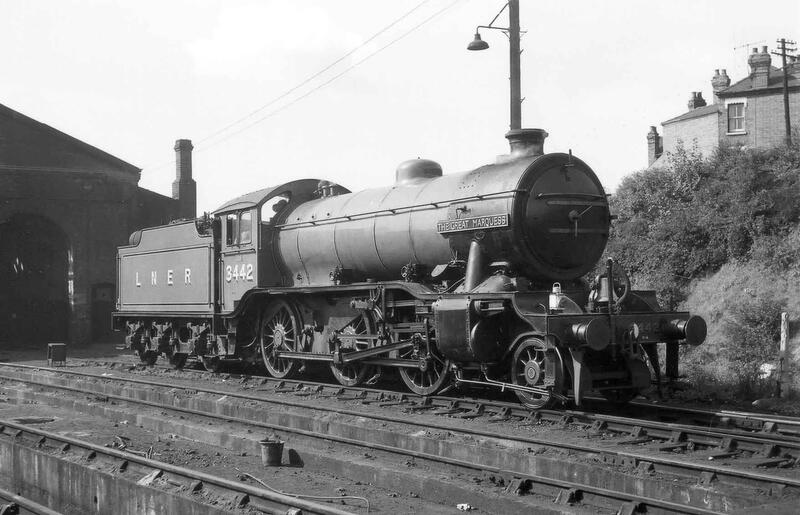 Also devoid of nameplates on 27th March 1965 is Worcester allocated 'Grange' No.6856 'Stowe Grange' which was built at Swindon in 1937 and was one of the last engines at Worcester being withdrawn in November 1965. 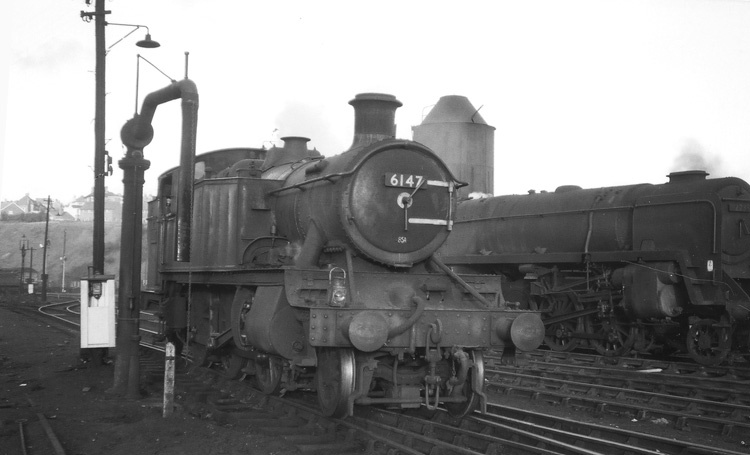 On the left is an example of the Collett '5100 class' of 2-6-2 'Prairie' tank locomotives. 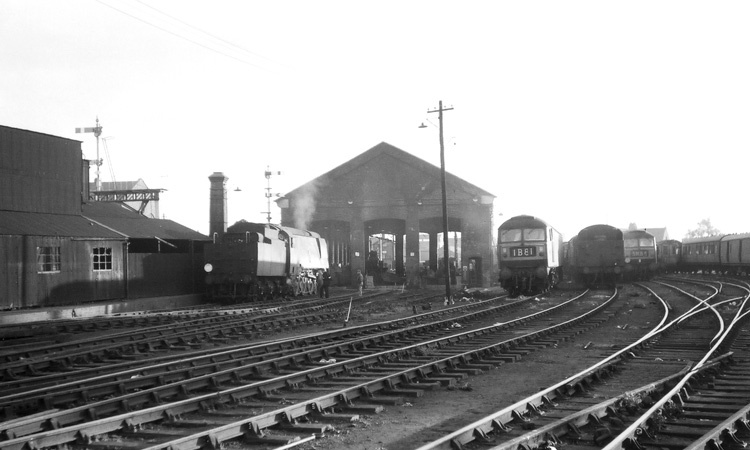 This classic view of Worcester Engine Sheds taken from Railway Walk on 25th September 1965 hardly gives rise to the feeling that steam traction would end at Worcester just three months later. By this date all passenger trains were scheduled for diesel haulage and there was very little work for the steam engines despite many being obviously in steam. No less than five locos are on the line by the coaling stage, these being 2-6-2 'Prairie' tank No.6147, Standard class 4MT No.75000, 0-6-0 Pannier Tank No.9626, ex LMSR 'Black 5' 4-6-0 No.44691 - a regular visitor from Saltley shed and Standard class 4MT No.75022. There is a knot of locos on the lines between the two engine sheds and another 'Pannier' tank is in steam in front of the goods shed. On 19th September 1965. Gresley's ex-LNER 'K4' class No.3442 'The Great Marquess' provided a rare moment of optimism at Worcester when it visited the shed for servicing after bringing in a railtour. The usual ban on visits was lifted and Robert was able to capture this fine study of the locomotive outside the goods shed. The railtour was taken back to Birmingham Snow Hill by driver Don Edwards and fireman Howard Griffiths. 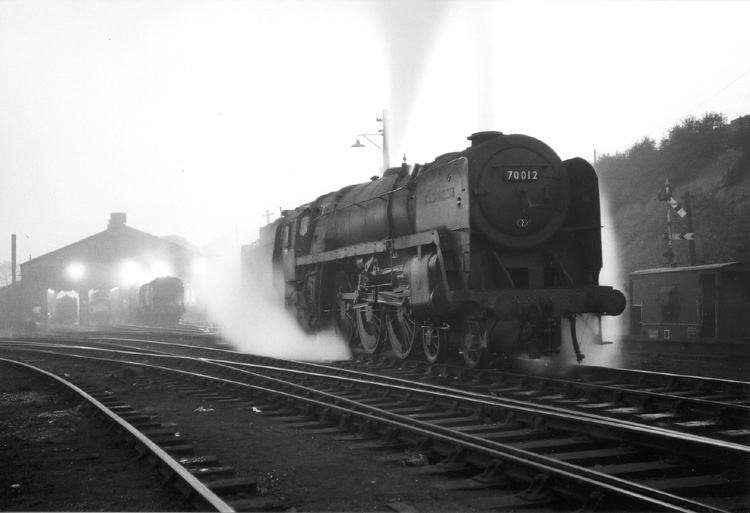 This atmospheric photograph shows BR Standard class 7P 4-6-0 locomotive No.70012 'John of Gaunt' in the shed yard at Worcester on 20th October 1965. Although devoid of nameplates the locomotive is displaying a '5B' (Crewe South) shed plate. Amongst several locomotives lurking in the 'goods' shed in the background is a class 37 diesel locomotive. This photograph shows ex SR 'Battle of Britain' class No.34079 '141 Squadron' on 28th October 1965, barely a month before the end of steam working at Worcester. One of thehe class 47 diesel on the right is No.D1592. The steam locomotive had arrived at Worcester for servicing after taking a special train to Cheltenham races. On the same date as the photograph above one of Worcester's 2-6-2 tank engines No.6147 (built in 1933) is seen at the water column. On the right is Standard class 9F 2-10-0 No.92235 of Bristol Barrow Hill Shed. 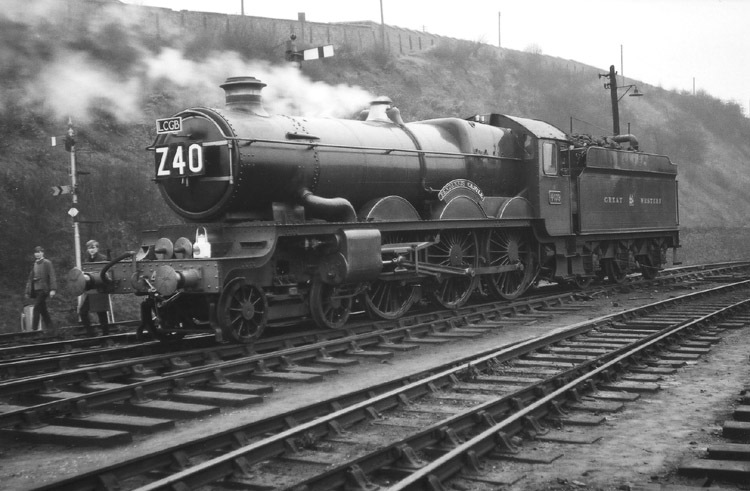 Preserved ex-GWR 'Castle' class 4-6-0 No.4079 'Pendennis Castle' was a visitor to Worcester on 20th November 1965 when it worked in on an LCGB special. 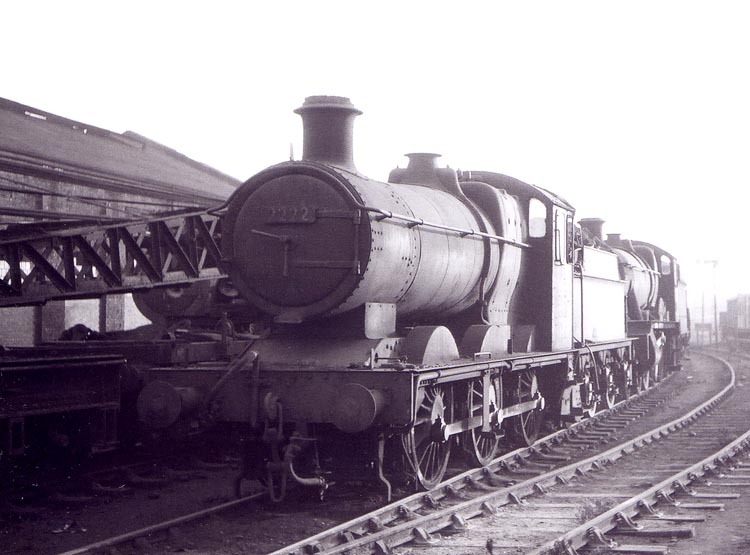 This photograph shows "Castle" class 4-6-0 No.7029 "Clun Castle" being prepared for service in front of the Goods Shed at Worcester on 23rd November 1965. On the left is an unidentified class 47 diesel. 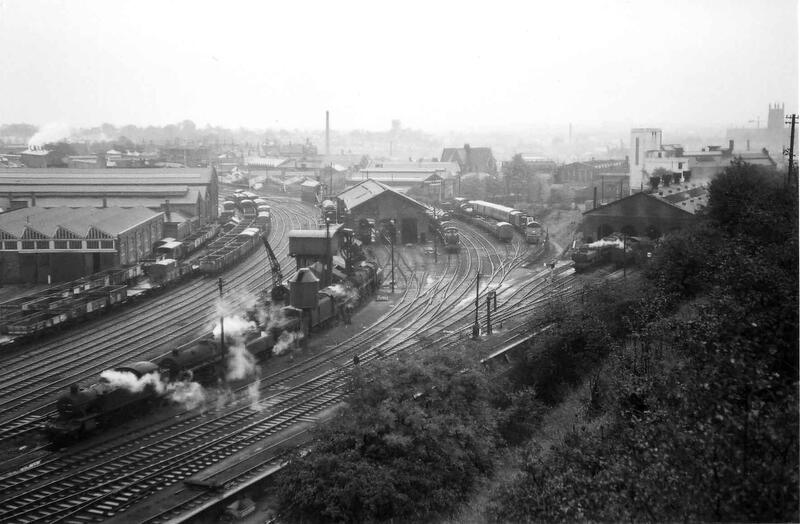 There is a wealth of detail in this interesting view of Worcester Engine Sheds in the period immediately following the end of steam operation from Worcester. 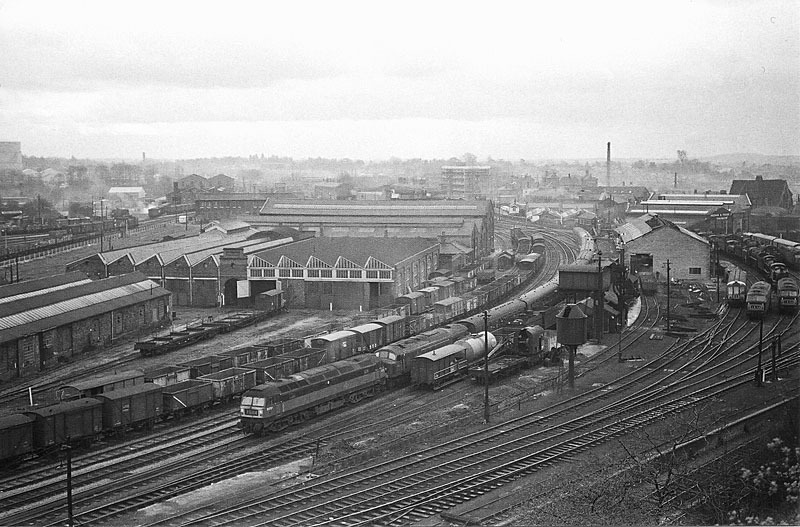 This photograph was taken from Railway Walk on 31st March 1966. 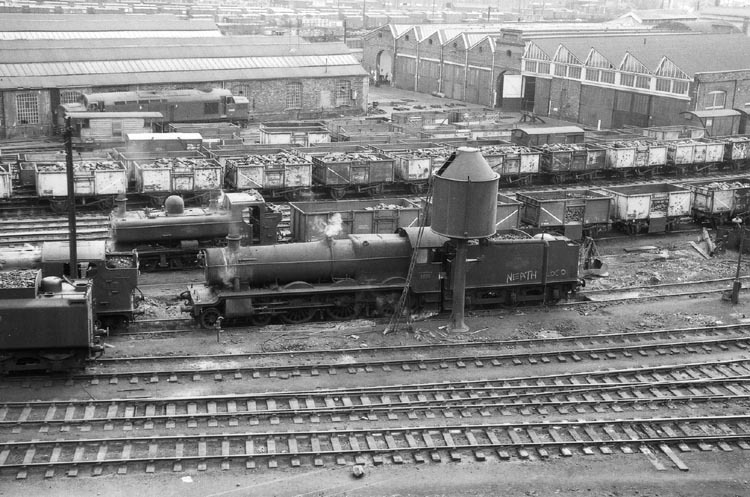 There is still plenty of freight activity in the yards to the top left of the photograph and also lots of wagons alongside the main line and in the wagon works sidings. The train is a Bristol to York express hauled by BR class 47 No.D1737 and BR 'Peak' No.D62. The former coaling facilities are still in place on the shed itself but the former three-road passenger shed has been rebuilt with only one through road on which stand several wagons. BR single car unit No.55003 a pair of class 35 'Hymeks' and a class 47 represent the working stock stabled on the shed with a small tranche of withdrawn steam locomotives which include ex-GWR 2-6-2 'Prairie' tank No.6147, an ex GWR 'Grange' class 4-6-0 and BR Standard class 9F No.92230 awaiting their end.